It’s possible to connect to your NVR without running the Ethernet/CAT5 cable straight to the router or modem you have on your network. Bypassing any Local Area Network completely. If you don’t have internet this method can be used. However you will not be able to access the NVR on your phone or by using DDNS on your computer away from home. This method involves using your computer, laptop or desktop as long as it has an Ethernet port, without using the internet to access the Web User Interface which you would connect to using your Internet Browser. Firstly, go ahead and setup your NVR near your computer, close enough to connect to it by the Ethernet cable. Inserting one end to the NVR and the other end to your computer. For the time being you will need to connect a monitor or TV to your NVR so that you can change the Network Settings to match your computers. Once connected go ahead and login to your NVR. 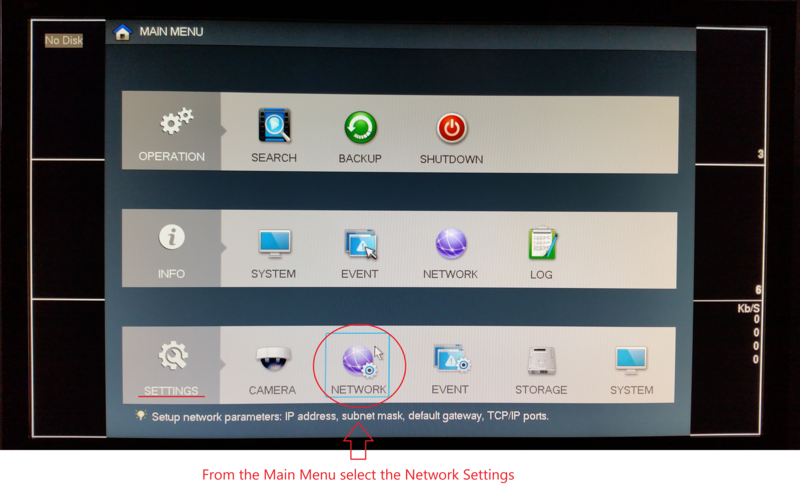 Once you’ve logged in navigate to the TCP/IP tab in Network Settings using the Main Menu. You will then have the Default Network Configuration up on your screen. 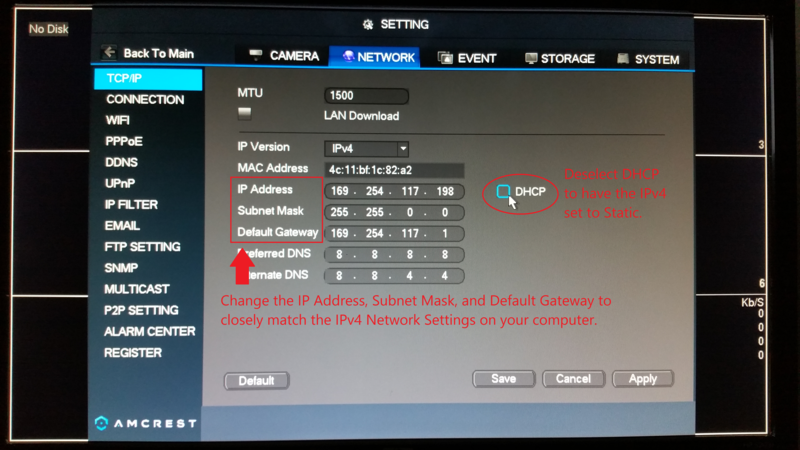 The IP Address, Subnet Mask, and Default Gateway will need to be changed to access the NVR on your computer. Login to your computer and open up an internet browser. This will be the only method you will use to access the Web UI through your computer. 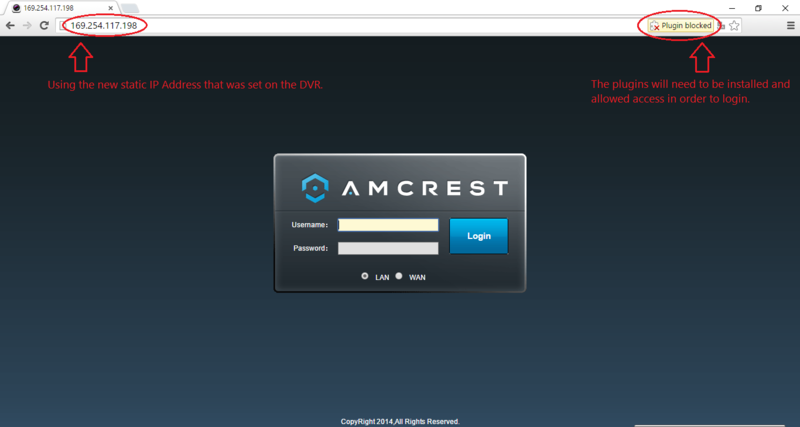 You will notice, using the default IP Address to attempt to gain access to the NVR will fail. We will need that new Network Configuration from the computer copied to match both the NVR and Computer. Open the command prompt on your computer. The quickest way to find it would be to use your start menu and search for “cmd.exe” run the application. Type in “ipconfig” and press enter. Scroll down until you reach Ethernet adapter Local Area Connection. 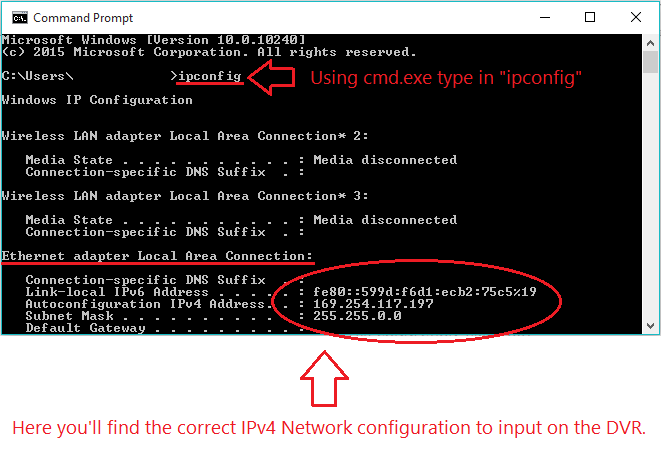 The Autoconfiguration IPv4 Address and Subnet Mask will be needed, either leave the window up or write this information down. Time to go back to the NVR. There will need to be changes made to the IPv4 Address reflecting on the NVR. Using this computer and images shown, I wouldn’t be able to use 197 on the NVR. Simply have the last digit in the IPv4 Address changed to 198 or 199, using any number between 0-255 that is not the last number in the IPv4 Address. Uncheck DHCP so that the Network Settings will be made Static, they shall not change when connected to any other Local Area Network or Ethernet Port. 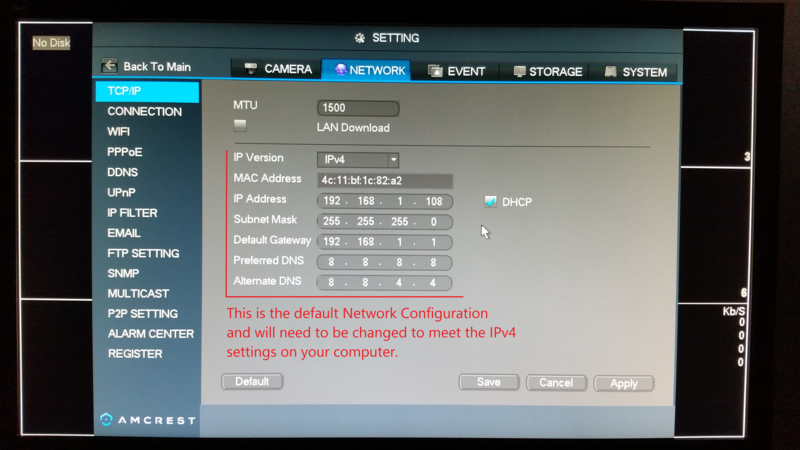 Copy the information from the computer to the NVR, like shown above using the IPv4 Address as the IP Address with the last number in the Address changed. The Subnet Mask must be identical. 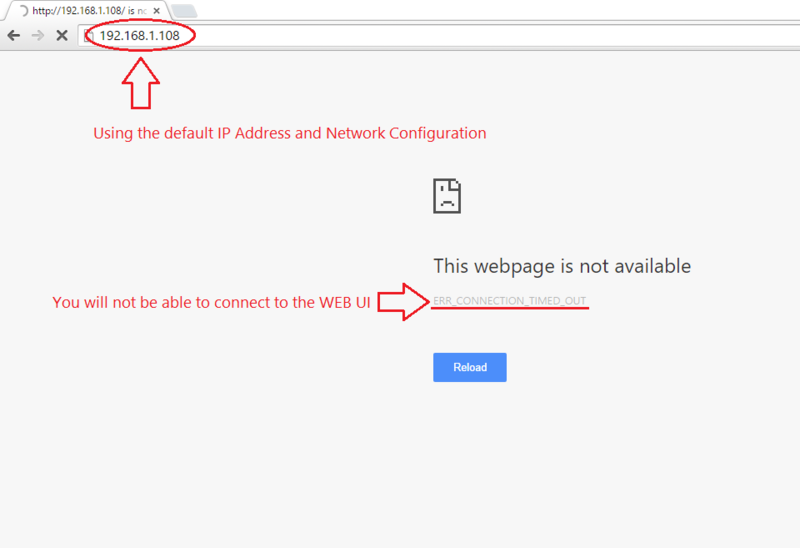 The Default Gateway will need to be changed to the IPv4 Address found on the computer, except this time the last number in the address will need to be changed to 1. Once these settings have been changed, Apply and Save the configuration. Now go back to the computer. Open up your Internet Browser and type in the new Static IP Address of the NVR in the address bar and press enter. The Web UI will be revealed. 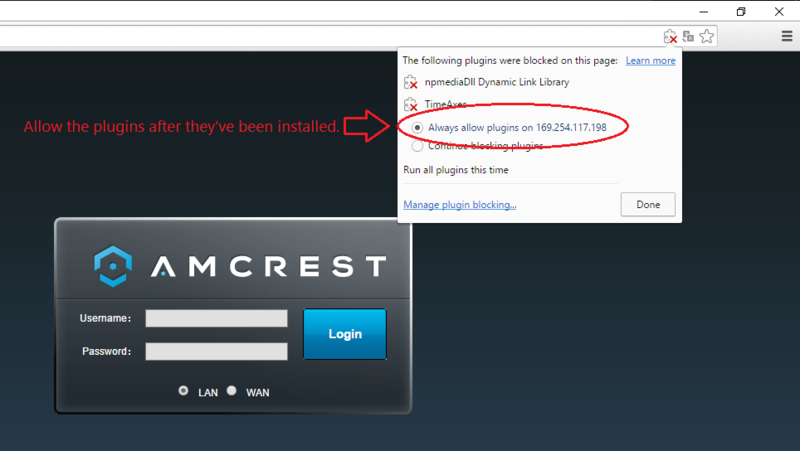 You may need to install the plugins and allow them to use this feature. After the plugins are installed on your computer allow the plugins to be run on this website. 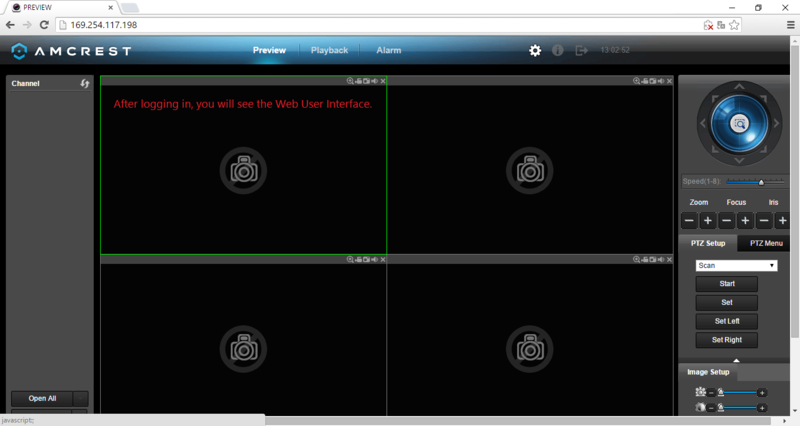 Finally the Web UI will be accessible and you’ll be capable of viewing the camera's, viewing playback of the recordings saved to the Hard Drive, as well as modify the settings of the NVR. 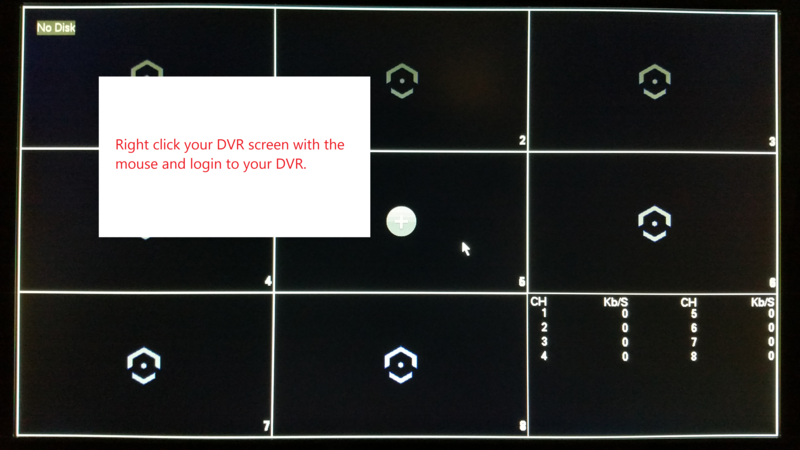 Now the monitor or TV that was used to view the NVR won’t be necessary, now that you can use your computer to monitor the NVR directly. Note: the P2P and DDNS features to monitor your NVR from your phone or computer away from the Local Area Network will not be usable since the NVR is not connected to the internet. There’s no way to share the internet through the Ethernet Port that the NVR is connected to by the PC. What Is The IR Wavelength of Amcrest Cameras?